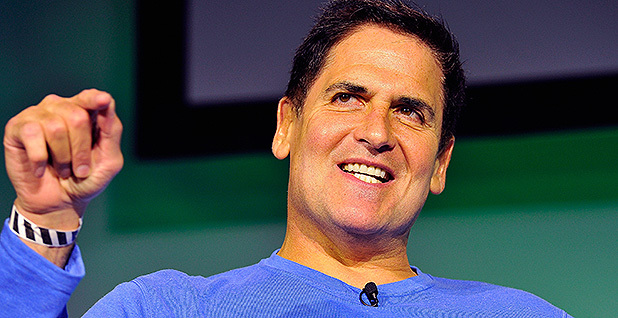 Billionaire entrepreneur Mark Cuban yesterday said "any reasonable person" should want to find a solution to climate change, a direct smack at President Trump's reported plans to pull out of the Paris Agreement. Contacted by E&E News, the Dallas Mavericks owner and investor on the ABC show "Shark Tank" said he does not believe withdrawing the United States from the global climate change accord is a prudent move. "I think it's a mistake," he wrote in an email. "Even if you are 99 [percent] sure that climate change is a hoax, that 1 [percent] of uncertainty should be enough for any reasonable person to want to buy time for technology to come up with a solution. "The Paris Agreement may not solve the problem, but it certainly helps buy time till a solution can be developed," he added. The comments by Cuban, a longtime Trump critic, came on the heels of Tesla Inc. CEO Elon Musk's threat to stop advising the White House if Trump pulls the plug on Paris. Trump tweeted yesterday that he will make an announcement today at 3 p.m. in the Rose Garden. Neither he nor White House spokesman Sean Spicer has confirmed multiple published reports that he has already decided to withdraw. Musk tweeted yesterday that he's done everything possible to try to convince the president to keep the United States in the deal. "Don't know which way Paris will go, but I've done all I can to advise directly to POTUS, through others in WH & via councils, that we remain," Musk wrote. 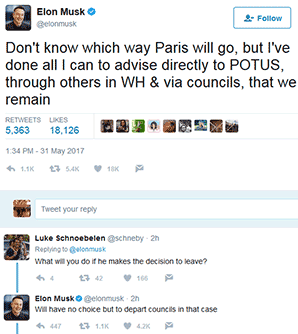 Asked via Twitter what he'll do if Trump decides to leave, Musk responded that he would "have no choice but to depart [the] councils in that case." Hundreds of companies from Exxon Mobil Corp. to General Electric Co. to Google have asked Trump not to leave the Paris Agreement. Exxon CEO Darren Woods wrote a personal letter to Trump about it, and 25 American companies have signed a letter that will appear in full-page ads today in The New York Times and The Wall Street Journal. Behind the scenes, though, clean energy executives and trade groups acknowledged that they are coalescing around the idea that they will shoulder a U.S. climate agenda without the backing of the federal government. "We are disappointed by reports that the U.S. will withdraw from the Paris accord, placing at risk not just our climate, but also the role of American companies in leading the way to a global renewable energy boom that presents a multi-trillion dollar business opportunity," Greg Wetstone, president and CEO of the American Council on Renewable Energy, said in an emailed statement. Yet even in the absence of national political leadership, clean energy and clean tech leaders said they will assume a leading role in reducing U.S. carbon emissions, both internally and in partnership with other governments and institutions in their backyards and around the world. "Just as they've done with other pivots and shifts at the federal level, businesses will step in and fill the leadership void," a senior executive of another major Washington, D.C., energy trade association said on background. On the Paris Agreement specifically, "we could see it was going to be a long walk from the campaign to wherever they might wind up," the executive added. "There's no question leaving would be a disappointment. But it's not the end of the road. The business community is engaged, and we'll work with any government or nongovernment organization that wants to be in this space." Yesterday's developments, while watched closely by supporters and critics of the international agreement to reduce greenhouse gas emissions, have particular relevance to advanced energy companies whose business plans are calibrated to the decarbonization of the economy. Dan Whitten, vice president of communications for the Solar Energy Industries Association, said solar manufacturers and installers "supported the Paris Agreement when it was signed and believe the U.S. should stay engaged." "However, regardless of what the president decides on the accord, we expect America's solar industry to continue to thrive and create jobs, boost the economy, and reduce greenhouse gas emissions along the way," he added. Trump, asked by the White House press corps yesterday whether he had been hearing such messages, replied: "I'm hearing from a lot of people, both ways. Both ways."